Representatives from Mitsubishi Motors North America, Inc., (MMNA), along with San Rafael Mitsubishi, conducted the very first fleet delivery of the all-new 100% electric-powered 2012 Mitsubishi i to the California Bay Area's City CarShare in a special ceremony held at the Green Vehicle Showcase located in front of San Francisco City Hall Plaza on Thursday, December 8 at 9:00 a.m.
City CarShare is a Bay Area nonprofit organization founded in 2001 with the help of several other local nonprofits and the cities of San Francisco, Berkeley and Oakland. Their mission is to promote innovative mobility options to improve the environment and the quality of life in the Bay Area. By providing short-term access to cars, City CarShare is reducing traffic congestion, parking problems and dependence on oil while promoting cleaner air and quieter streets. 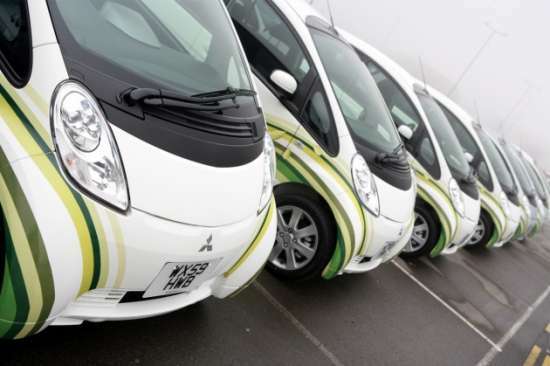 "We are very pleased to introduce the all electric Mitsubishi i into our fleet. This vehicle brings us one step closer toward our goal of having 50% of our fleet run on alternative fuel as part of our mission to decrease carbon emissions in the Bay Area," said Rick Hutchinson, CEO, City CarShare. Numerous fleet orders have already been placed for the innovative, environmentally-friendly and fun-to-drive Mitsubishi i by a wide variety of organizations - multinational corporations, municipalities large and small, major utilities and nonprofit organizations - from New York to Hawaii. "We thank the Bay Area's City CarShare for being the first fleet recipient of our innovative 100% electric-powered vehicle," said Yoichi Yokozawa, President and CEO of Mitsubishi Motors North America, Inc. (MMNA). "City CarShare's stated goals are to help promote modes of personal transportation that help improve the environment while reducing noise pollution as well as fossil fuel dependence, so the 2012 Mitsubishi i is the perfect vehicle to help achieve this nonprofit's ambitious mission." The 2012 Mitsubishi i is the first of several new advanced, alternative-fuel production vehicles that the Japanese auto manufacturer plans on bringing to the North American market in the next few years.